To access the results screen in CommuniGator, click into the 'Campaigns' section, and then click the 'View Results' button for the campaign you wish to look at. This will take you to the results screen for that specific campaign. This Article will take you through the overview of the results and their meaning. 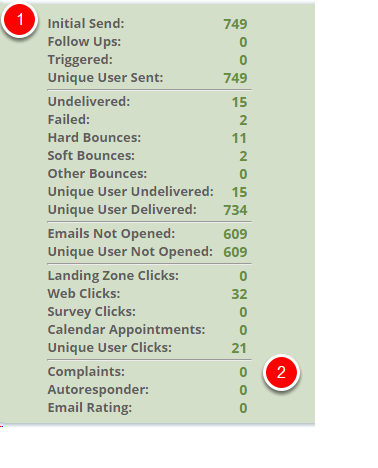 How many of your emails were delivered - Some emails may not be delivered due to bounces or technical issues. Overall percentage of your click to open rate. This would be your unique clicks divided by your unique opens x 100. This is a list breaking down everything in your campaign, such as how many landing zone clicks, how many bounces specifying hard or soft or other. If you have a follow up attached to your campaign this is also how you view how many have gone out.